Imagine you’re taking a late afternoon stroll along a deserted Pacific Coast beach. The sun hits the water at just the right angle and you catch your breath—the blue in the waves is absolutely electric! 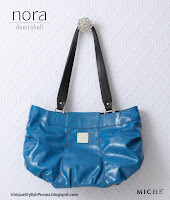 We’ve captured that very color in the enchanting Nora Shell for Demi Bags, and you’re going to fall in love with blue all over again—promise! Textured faux leather with gorgeous ruching details on each end.